Creating a culture of science learners hinges on dragging my tadpoles (my students) back into the real (or natural) world. Yes, I'll have the assorted scaly critters in the classroom, but that's not enough--the kids associate critters with the "natural" world, the one outside. It's unnerving to realize a snake can hold their attention longer than I can. Most of the kids have a handle on what a foot means, and the school may well have tens of thousands squirreled away. If the meter was not so, well, unruly, it would have been adopted years and years ago. It's exactly too big and too small to be useful in the classroom. It's too big to fit in a backpack. Even in the good ol' days, we did not walk around with yardsticks, but we all had rulers--we spun them on pencils, played desk hockey, fenced with them, and occasionally even measured things, but they were an intimate part of our school environment. You could not help but develop an innate sense of what one foot meant. The meter is too small to make a decent sized decimeter, which happens to be less than 4 inches. No self-respecting American kid is going to carry a ruler that's shorter than a used pencil. When France gets around to redefining the meter as a useful length, Americans will adopt it. Ahem. So yes, I do allow American rulers in my classroom. Science requires measuring time. Time escapes my tadpoles. Time escapes all of us. During the last week of school, a few days before the solstice, several Honors history projects were strewn in the hallway, waiting to be tossed. One of them was a model of Stonehenge. 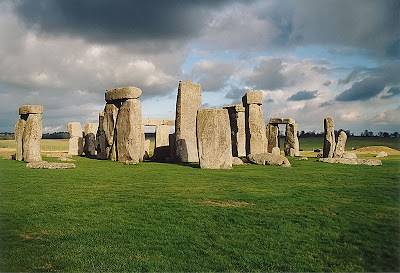 If the huge stones were aligned to predict the solstices, Stonehenge could serve as a fine example of keeping time. I wonder if the child who built the model thought about the science behind it. Knowing the exact time beyond how many minutes are left before the end of the period matters little to me. The things I care to follow--tides, sunsets, and seasons--defy wristwatches. I am not, of course, going to abandon the stopwatch in my class, nor am I going to ban digital watches (though there are some reasonable arguments to do so). I will however, clean off the sundial in my garden, and bring it to class. I will spend a few minutes explaining how to use it, then I will place it on the windowsill, "set" the time, and forget about it. Sometime during the year, the creeping shadow on the sundial will prove more captivating than my 23rd Powerpoint slide of the day, and a child will notice that the shadow no longer falls where it used to. Should that child raise her hand to ask about it, true inquiry will begin, and I'll jump on a teachable moment. My "spontaneous" lesson will last about 10 minutes, and the students will never know the lesson was crafted in August. Many of my lessons crafted in August will never get used, but that's OK, because a good chunk of our lessons can only work when the students seek the answers. Birds do it. Sea turtles do it. Salmon do it. Even bacteria do it. They can all find their way around using the Earth's magnetic field. What does "north" mean to a turtle? What does it mean to a sophomore? Not sure it means much to either. The turtle "knows" which way to go when, and the student can look at a GPS or a map and "know" north. Heck, I'm not sure I know what north means--is pointing to the left of a sunrise sufficient? Does pointing in the direction of the North Pole count? (Pointing parallel to the ground due north is not pointing to the pole.) Does magnetic north count? My tadpoles spend a lab period or two playing with water, part of which involves floating metal paper clips in a cup of water, a wonderful demonstration of surface tension. This year I think I will use pins. I might even be sneaky enough to surreptitiously magnetize a few of them, backed by the bud of a hidden lesson plan waiting to blossom. When a few of the needles start dancing on the water, insisting on pointing a specific direction, I'll play dumb, see how much my tadpoles notice. Once a few students notice the pins all point in the same direction, I'll ask them how how that might be useful, even if they do not understand why the pins do what they do. Photo of Stonehenge by Frédéric Vincent via wikimedia, released under CC. Australian rulers are 30cm long. Can send you some if you like =). Still, there is some kind of homage or respect in making train tracks by the width of a horse's rear. Perhaps there is something nice about the unabstractness of imperial measures. Still connected. I was working in a herbarium, which is like a plant reference library. I learned that Chinese culture defined species by their role for society, what they were used for. Western species might have a descriptive common name, but tended to be named after an individual European bloke who happened to document it first. Still think that is a kind of professional myopia. I like the word "unabstractedness"--still connected indeed. I did not realize that you work in an herbarium--I am jealous, something unusual for me. I fear professional myopia defines professional culture. I'd like to be proven otherwise.